The first time I made the Best Chocolate Bundt Cake was back in 2012. I was a young married lady and an even younger blogger, slowly teaching myself how to cook and bake and living on the thrill of anything even halfway decent coming out of my oven. Then this cake happened. For a fledgling baker, tackling a homemade bundt cake with a from-scratch glaze felt like an Olympic task. I remember how nervous I was when it was time to flip the cake out of the pan. Even years later, my palms get a little sweaty during this step. But there was nothing to fear. The cake popped easily out of the pan and onto the plate. I did a little happy dance, then smothered the cake with the glaze and cut myself a slice. Sweet heavens. I wanted someone to hand me a medal right then and there. This was the best chocolate cake I’d ever eaten, and by some miracle I had made it myself. After devouring my slice, I stuck the cake on a garishly red kitchen towel, took some terribly lit photos of it, and posted it on my blog. Because that’s what you did when you were a newlywed with too much free time in 2012. Six years later, this chocolate cake is one of my most popular and best reviewed posts of all time. Looking back on those original photos (which I will include at the end), I still feel a giddy sense of pride bubbling up inside me. This cake has a way of making you feel like a rockstar. My sister-in-law, who has made it several times, said her co-workers didn’t believe she actually made it herself, thinking something this good could only come from a professional bakery. To that I say, “Pshaw!” You can absolutely make something as good as the local bakery. And once you discover that fact, there’s really no turning back. You’ll start making Giant Bakery Style Chocolate Chunk Cookies, Sour Cream Cheesecake, and Two Layer Strawberry Cakes and feeling like a boss all the time. But I’m getting ahead of myself. 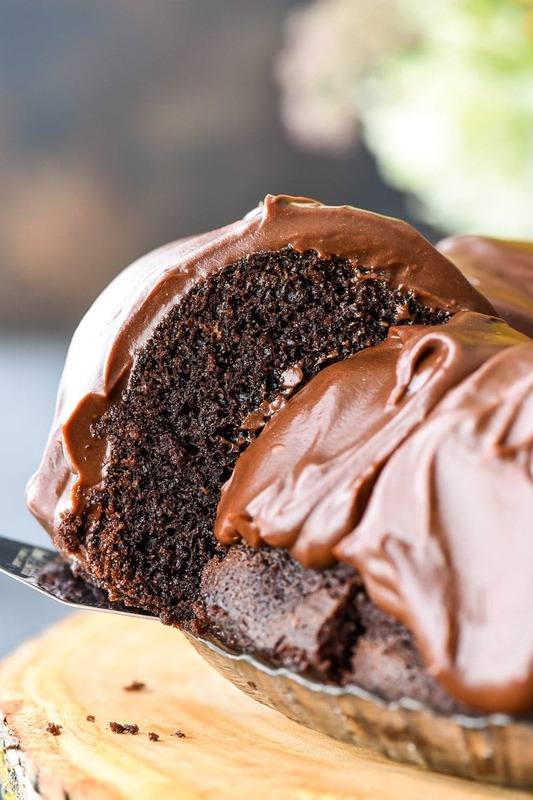 Let’s talk about what makes this cake the very best chocolate bundt cake of all time. I believe there are two key ingredients at play here that really make this cake special. The first is brewed coffee, which is like chocolate’s personal hair and makeup specialist, always behind the scenes making sure the chocolate shines. The second is buttermilk, which we can thank for giving this cake its tender crumb and subtle tangy flavor. Then there’s the glaze. Oh my. Where to begin. 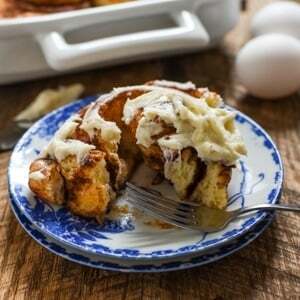 The glaze begins with a base of unsweetened chocolate, butter, and sugar, but it gets its spectacular flavor from the addition of sour cream, coffee, and cream. The glaze feels wonky when you’re first whisking it up. One moment it looks too thick and the next moment a bit too gloppy. You might find yourself questioning your newly discovered baking skills and wonder why in the world that Courtney girl steered you wrong. But then the coffee and cream and your gentle but persistent whisking start bringing it all together, and the glaze begins to look like a rich mocha latte, and you’ll get all the good feelings back, because now you’re basically a master baker and barista in one. This glaze lies somewhere between spreadable and pourable. It is quite thick, and quite easy to eat by the spoonful, but I suppose that’s beside the point. If you’d like it to be a little more pourable, you can add more milk or cream. The glaze makes a substantial amount, more than you might think is necessary. I generally use about three fourths of it then save the rest, often adding the remainder on later. It really is the proverbial “icing on the cake,” so I find it’s never a bad thing to be generous. This cake is an excellent candidate for making a day in advance, as I think it gets even better, richer, moister on the second and third days. It is a rich cake, so technically you could probably squeeze 20 teeny slices out of it, but you’re more than likely going to want to stick with 12 or so thick, fat slices. I would tell you to serve it with ice cream or milk, but on this rare occasion, I believe the cake stands best alone, in all of its dark chocolatey glory. 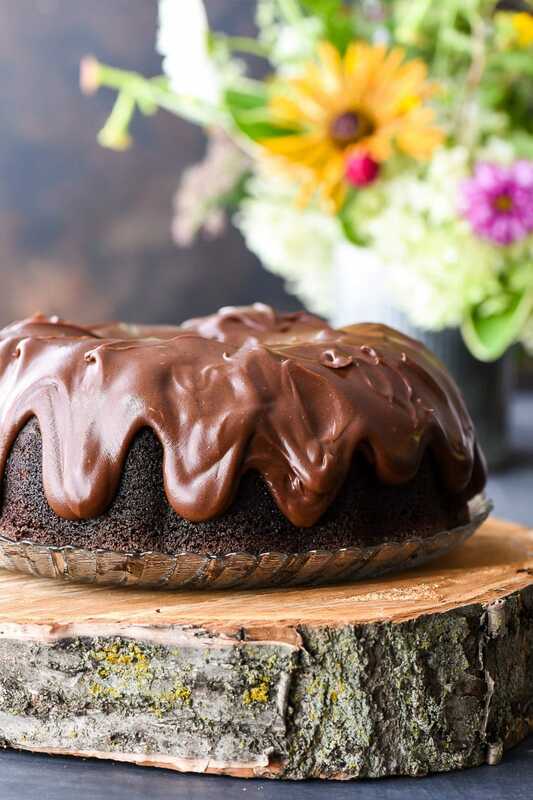 If you’re looking for a show stopping dessert, the answer to an insatiable chocolate craving, or just a way to get your baking mojo back, I can’t recommend this cake enough. If it can survive my fumbling 2012 baking skills and pictures like this to become one of my most made and best reviewed recipes, it’s certainly worth a try. If you’d like to see what other people are saying about this cake, you can check out the comments or read the reviews on this pin on Pinterest! 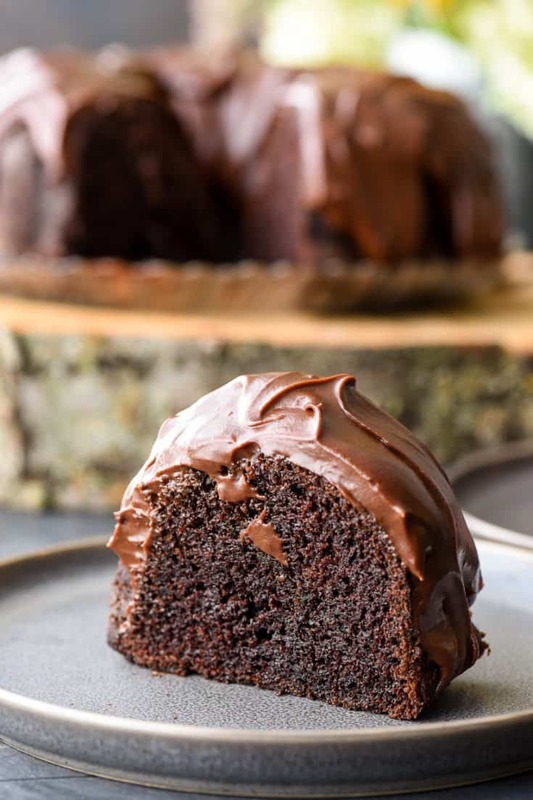 A rich, super moist chocolate bundt cake covered in a dark chocolate glaze made with coffee and sour cream. 1. Preheat the oven to 350 degrees. Grease and flour a 10 in round bundt pan. Set aside. 2. For the cake: Place cocoa powder and coffee in a small saucepan and bring to a boil, whisking constantly. Remove from heat and allow to cool. 3. In the bowl of a mixer, combine sugar, salt, baking soda, eggs, and yolk. Beat on low speed for about 1 minute. Add buttermilk, oil, and vanilla and beat for another minute or so. 4. Add flour to sugar mixture and beat on medium speed for 2 minutes. Add the cooled cocoa/coffee mixture and beat on low speed for another minute. 5. Pour into the greased pan and bake for about 1 hour, or until a toothpick inserted in center comes out clean. Let the cake cool completely before inverting onto serving tray. 6. For the frosting: Chop the chocolate into small pieces and add it to a double boiler or heat proof bowl over a pot of simmering water. Melt chocolate, stirring occasionally. 7. Melt butter in another pan or in the microwave. 8. In a small bowl, whisk together the butter and chocolate. Add half the powdered sugar and whisk again. The mixture will seem very thick. 9. Whisk in sour cream and the remaining powdered sugar. Don't worry! It will come together! And it will be magical. 10. Add coffee and cream and whisk together until smooth and glossy. This is a thick, spreadable frosting. If you'd like a more pourable glaze, simply add additional cream or half and half until you reach your desired consistency. Made this for a birthday party at work. Co-workers raved about the frosting. Not overly sweet like some frostings, just right. Cake itself was very moist. Don’t start making this cake in the evening though. There are 2 cooling times required. The cake in the pan took about 1 1/2-2 hours to completely cool. Wonder if it would be OK to put the pan in the fridge to cool? I got worried after adding the sour cream and powdered sugar in step 9 because the frosting looked kind of globby, but you were right, when the coffee and cream were added it all smoothed out beautifully. This recipe took time but it wasn’t hard and it was definitely worth it for the compliments I got at work! This was seriously the best chocolate cake ever… EVER!! Thanks for the awesome recipe!! I made this without the frosting and it was very good! 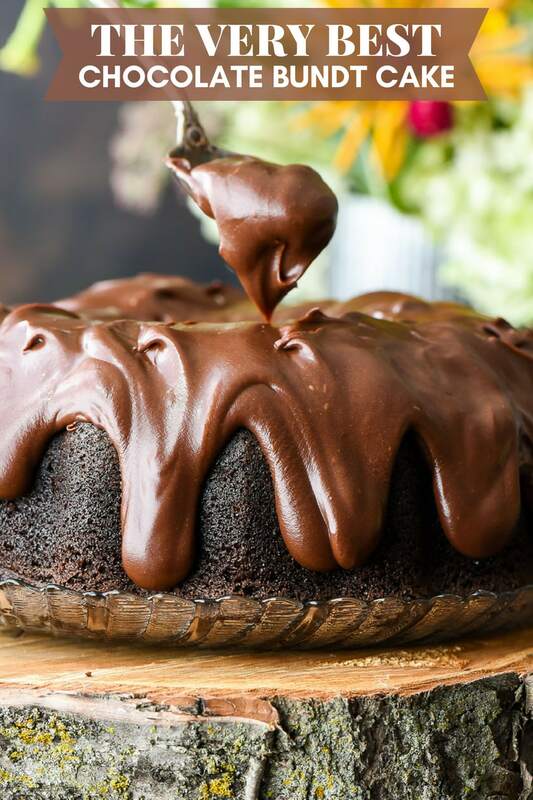 We served it as a birthday cake drizzled with chocolate ganache, and everyone loved it! 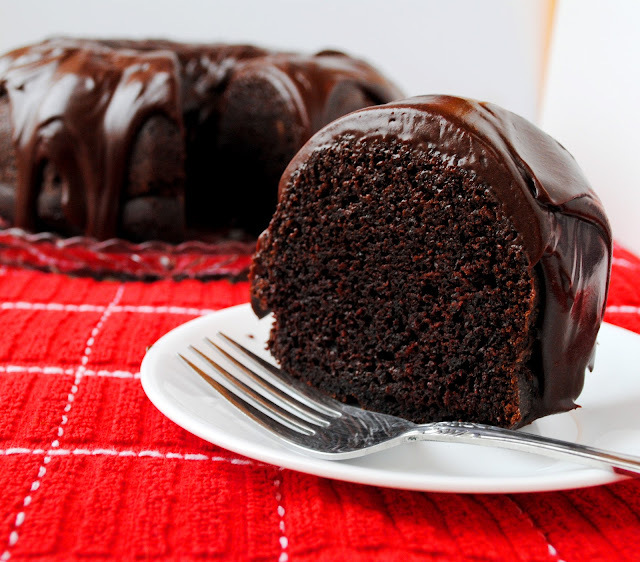 Not too sweet, moist and chocolatey. Thank you!! This one is a keeper and will make again, Oh and it was easy! One bowl! Thanks for trying it! I’m so glad you liked it. Anyway I could use a vanilla frosting? I just start learning to bake this cake looks so good, but I love Ho plate cake with vanilla frosting. Does anyone have a vanilla frosting recipe I could use? Hey Amanda, Mine usually doesn’t sink that much when it’s finished. Without being in the kitchen with you it’s hard for me to tell what might have gone wrong. You may want to check and make sure your baking soda isn’t expired. I would cut a slice and try it…it might still be perfectly delicious! I’m sorry I can’t help more! I just made this in 2 small cake pans instead of the bundt pan and put chocolate frosting in between them. Made a 2 layer cake. It turned out wonderful! Thanks for such a delicious recipe! So glad it was a success! Thanks for taking the time to come back and comment. I may have to try this as a layer cake next time too! Did you change the baking time or anything? Also, did you used 8 in or 9 in round baking pans? Best chocolate bundt cake I’ve ever had! I made it with a salted caramel glaze & it is delicious! I made a couple of substitutions (I used coconut oil and some applesauce in place of the canola oil), but I doubt that changed the cake too much. So moist & perfect. This is definitely the recipe I will use from now on. Thanks! Oh the salted caramel glaze sounds FABULOUS! I’m so glad you enjoyed the recipe. I’ll have to try it with coconut oil and applesauce next time. Thanks for coming back to let me know how it worked! does it have a coffee flavor? I didn’t think so – really all the coffee does is enhance the chocolate flavor. I use coffee all the time when I make brownies and chocolate cake. Hope that helps! Yep what Robin said! There’s not a strong coffee flavor. HI I AM MAKING PUSH POP CAKE FOR MY FRIENDS DAUGHTER CAN I POUR THE BATTER IN A REGULAR CUP CAKE PAN AND BAKE THEM? 1 1/2 cups of what with the coffee?? I’m sorry Laura, I don’t understand the question. Where do you see 1 1/2 cups with the coffee? Please can you let me know if I have to use 1 1/4 cup of water and 1 tbsp. 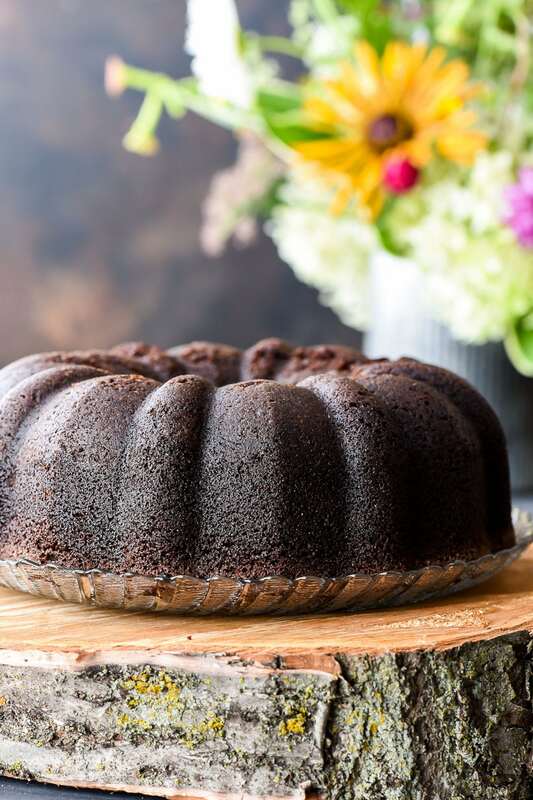 coffee powder mixed together or 1 1/4 cup strong brewed coffee….need to make this cake for our Thanksgiving and my birthday this weekend. It’s 1 1/4 cup + 1 Tablespoon strong brewed coffee. No coffee powder. I looked back at the recipe and could see how it could be confusing, so I’ve changed it now! 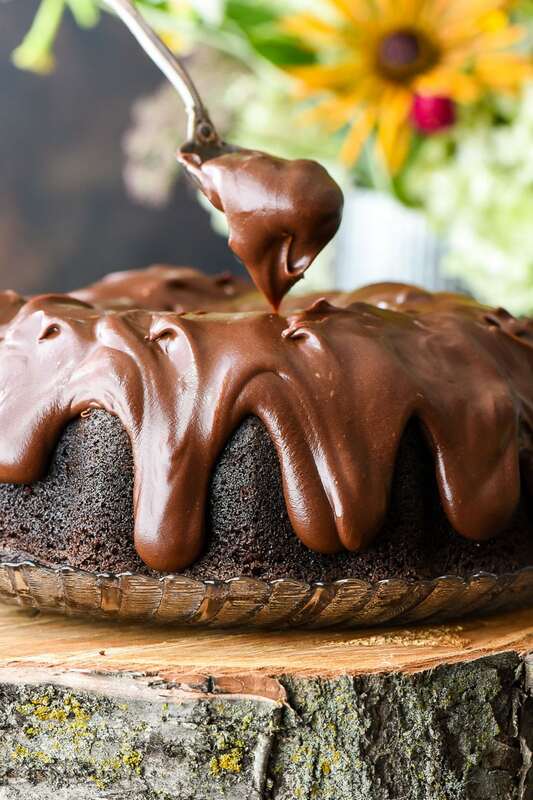 Hi there I really love the look of this chocolate cake and I really want to try it. But as it’s just my husband and I at home can I make half the recipe for a small cake? Thank you so much.. the cake looks great .. can’t wait to try it !! Hi there! I’m so sorry for the delayed response. I’ve never tried halving this, but it might work! You could also freeze half of the baked cake unfrosted and save it for another day! I think you could substitute an equal amount of water, but the flavor will not be as rich. Also, chocolate has a small amount of caffeine in it as well, so the recipe will still have caffeine even without the coffee. Maybe just try decaf coffee! This is definitely the best bundt I have ever had. I’ve made it several times since finding this recipe and it never disappoints! The only bad part is that I eat half the cake each time ? Thank you for coming here to let me know! That just made my day! Thanks so much for coming back to let me know Lynne! I’m so glad the cake is a hit with your family! I would like to make today to take tomorrow will it taste like its fresh ?? I’m so sorry I wasn’t able to respond to this in time. I hope you went ahead and made the cake. 🙂 I think it is even better the second day! help! i just realized i only have 2 eggs and no yolk… what can i put instead? (i already started with the cocoa mixture and i’m too lazy to go to the store). I must say that i made this cake before and it is hands down the best cake in the world. Hi Leah! I’m so sorry I didn’t get to your post sooner. I hope the cake turned out ok for you. I’ve never substituted for the extra egg yolk before, but if that happens again I’m guessing you could add a few extra Tablespoons of sour cream with good results. I know how frustrating it is to be short on ingredients midway through. I’ve definitely been there before. I’m so glad you like the cake! I hope it turned out wonderful for you! Wonderful! I’ll have to remember that in case I’m ever short. What kind of frosting was used in the photographs? The recipe for the glaze is a very light color when made compared to the dark-silky frosting in the pictures. It’s the same frosting as what is in the recipe. I hope you enjoyed it even if the color seemed lighter. thanks for the wonderful and easy to make recipe. just wondering about the egg part before baking— is it 2 full eggs plus 1 yellow? and can it be substituted with any other ingredients for my Vegetarian friends. That’s correct. It’s 2 full eggs plus 1 yellow. Eggs are actually vegetarian, so they should be fine for any vegetarian friends. If you have vegan friends, you may need to look at other substitutions. I’ve never tried any before though, so I can’t say for sure they’d work! This is truly the best chocolate cake. It’s become my go-to cake. I just received a new Nordic Ware Bundt pan…the Blossom one…and I didn’t want to hide the shape of the cake, so I just sprinkled icing sugar over the cooled cake…beautiful and still just as amazing. This is the best cake. I’d add a photo, but I’m not sure how to. made this and it was excellent. instead of making the frosting, I used store-bought butter cream icing . will make this again . best chocolate cake i have had in many years. I am so glad you enjoyed it! Thanks for coming back to let me know! I plan on baking the cake and serving it the next day. My question is can I make the frosting the day bake the cake or does it have to made right before serving? You can definitely make the frosting a day ahead. If it gets too thick to pour, just stir in a little milk or cream or warm it up. Hope you love it! Thanks for your answer Courtney. Will definitely let you know how it turns out. I have made this cake at least 10 times! It is truly the best!!!! Yay! So glad you enjoy it. Thanks for letting me know! 2 1/2 teaspoons Baking soda? The moistness and texture of the cake was great but the taste was terrible, and seemed to be from the baking soda. Was it a misprint and should have been baking powder? I was skeptical about the baking soda when I read the ingredient list, but thought i’ld give it a try anyway. So sorry to hear you didn’t enjoy the cake, Lynne. It’s not a misprint, and myself and many other people have made it and love the taste. I wonder if perhaps a dutch process cocoa or extra dark cocoa could have made it taste bitter? This is an amazing chocolate cake. I’ve made it twice with rave reviews from everyone. So moist and rich. Can you use this recipe for cupcakes? I’m so glad you like it! I’ve never used this recipe for cupcakes, but I don’t see why it wouldn’t work. I think it would make A LOT of cupcakes though! I tried it and it made 3 dozen lushy chocolate cupcakes. I baked them for 17 minutes at 350 degrees. Made this for a holiday party. Little did I know a celebrity chef from the Napa Valley his wife made a chocolate cake but not a bunt. Anyway there they were two chocolate cakes side by side. Having never made this recipe before had little to no hope of being the crowd pleasing winner. This cake not only came out perfectly it dusted the the celebrity chef’s wife’s cake in all areas. Flavor, moisture, looks. Anyway I have been asked for this recipe several times. I am not a baker so if I can pull this off anyone with a bunt pan can! I did use high quality coco from Whole Foods, Valrhona and fresh brewed espresso has the coffee in both the cake & frosting. Thank you for sharing your recipe this is a keeper! I usually do not eat my own baking as I give it away. Stood there slicing slivers from both cakes just to make certain my mind was not playing tricks that my cake indeed did TAKE the CAKE!!!! Happy Holidays from the Napa Valley! This is the best story! Thank you so much for sharing. I’m so glad you and everyone else enjoyed it! This is great to know! Thanks for sharing the GF and DF conversions. I just made this today and I’m really impressed. I’m a pastry chef trained in Paris and this chocolate cake is one of the best things I’ve baked in my life. Thank you for sharing with us. What a compliment! I am so glad you enjoyed it. Thanks for coming back to share! 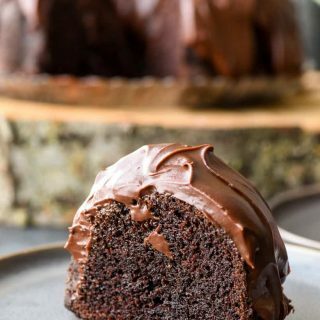 I bake a lot and this chocolate bundt cake is terrific. Stays moist and is a 5 star in my book. My question is: the frosting/glaze, though delicious, does not harden and makes it difficult to cut and give to friends because you can’t cover it with foil, etc. Do you think that cutting back on the butter would correct this issue or maybe it would be the liquid? I used cream not 1/2 1/2 and I even added additional powdered sugar to try and get a stiffer texture. Thoughts? Thanks in advance. I’m so glad you like the cake! This frosting is definitely a softer/fluffier frosting. My advice if you’re looking for something that will harden is to go with a chocolate ganache. It won’t be as fluffy, but it will still be very rich and it will harden. My friend Melanie has a great microwave ganache recipe- https://melaniemakes.com/blog/2017/02/microwave-chocolate-ganache.html. You can even sub in a little coffee for the cream if you’d like to keep that flavor. With ganache, you can also always adjust thickness (and hardening) by adjusting the chip to cream ratio. More chips will give you a harder glaze. Hope that helps! Just trying this for the first time, it’s in the oven 😁 just wondering how you’d store it overnight? In the fridge? I actually usually just store it at room temperature, but if your house is warm or you’re transporting it, I would probably refrigerate. The frosting will be pretty stiff if refrigerated so you might want to leave time for it to come to room temp before serving. Thank you for a lovely recipe. I made it today, we ate some tonight (yum! ), so good. The icing was such a “magical” experience, gloppy transformed into sleekness, amazing. The cake is so rich & moist, I love the texture. It will definitely become a favorite recipe. I tried out this cake recipe today. The cake turned out moist, but is pretty dense and jiggly. After cutting a few slices of cake (fresh from the oven), I returned about half an hour later to find that the cake had shrunk about half an inch! What did I do wrong? Please advise. If buttermilk is not on hand, is it okay to use sweet milk? Or should I make buttermilk with sweet milk and vinegar? I would use regular cow’s milk with vinegar as a substitute! 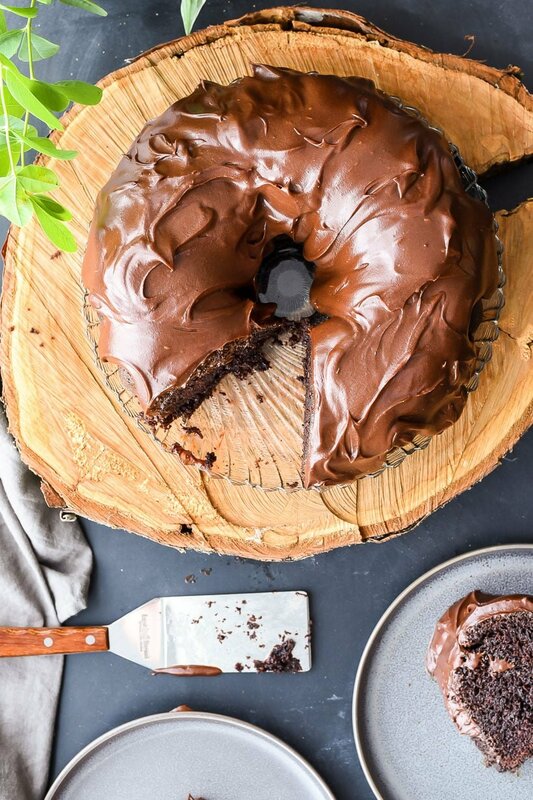 This has been my go to chocolate cake recipe! It always comes out perfect and delicious. I would like to make this into a 18 x13 birthday cake. Any suggestions?? Would it be safe to double the recipe? I’m a bit worried about it baking completely in the middle. I’d appreciate your thoughts. Hmm…that’s a great question. I’ve never tried to bake this in a rectangular pan. I think the standard batter would probably fill a 9 x 13 inch pan perfectly. 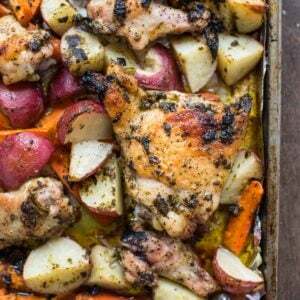 You could certainly try doubling the recipe to fill a larger pan. I’m guessing you would need a longer bake time to get it to cook through. I would just advise keeping a close eye on it! Sorry I can’t give more specifics, but I hope it turns out wonderfully! I mad this cake yesterday and everyone thought it was delicious – it was even better today! It stays very moist. This recipe is a keeper. Next time I will make it in layers with a buttercream frosting for a change. Thanks for sharing this recipe! HI, CAN I USE DUTCHED COCOA??? THANK YOU!! I actually would t recommend subbing Dutch cocoa in this recipe. Where has the recipe gone? . I baked the cake and now I need to make the glaze. I cannot see the recipe only comments. I’m so sorry about that. The recipe cards were temporarily down. Everything is back up and working now! Please let me know if you have any other issues!